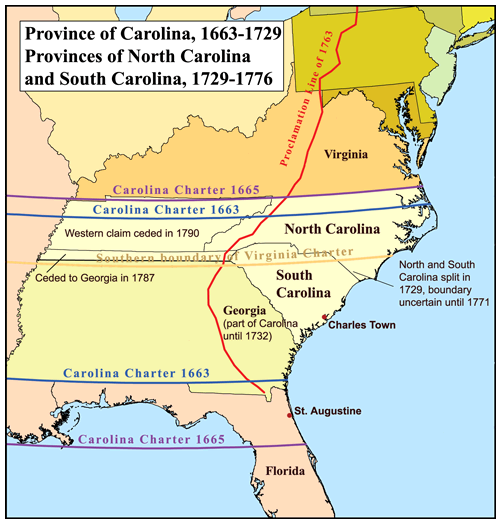 Carolina wasn’t founded as an English colony until 1629, when the English King, Charles I, granted all of the land between the 31st and 36th latitudes in America to his attorney general. The area was named the Province of Carlana, but was eventually changed to Carolina, after the Latin form of the king’s name. In 1663, after the Restoration, Charles’s son, Charles II, gave the land to eight English noblemen called the Lords Proprietor, and the first English settlement in Carolina was established in 1670 at Charles Towne. It wasn’t long, though, before French settlers began to make their appearance there. I’ve written before about my own “French connection“—how one of my first ancestors born in America was a full-blooded Frenchman. Andrew Dubose, born in 1699 in Jamestown, Carolina (also known as Saint James Santee or French Santee), was the son of two Huguenot settlers who emigrated from France to Carolina at the end of the 17th Century. They were two of an estimated 400,000 Huguenots who left France for England, Holland, Germany, Switzerland, South Africa, and America in the years before and immediately following King Louis XIV’s revocation of the Edict of Nantes, which had given limited religious freedom to French Protestants. The thousands of Huguenots who settled in Carolina ended up leaving quite an impression. 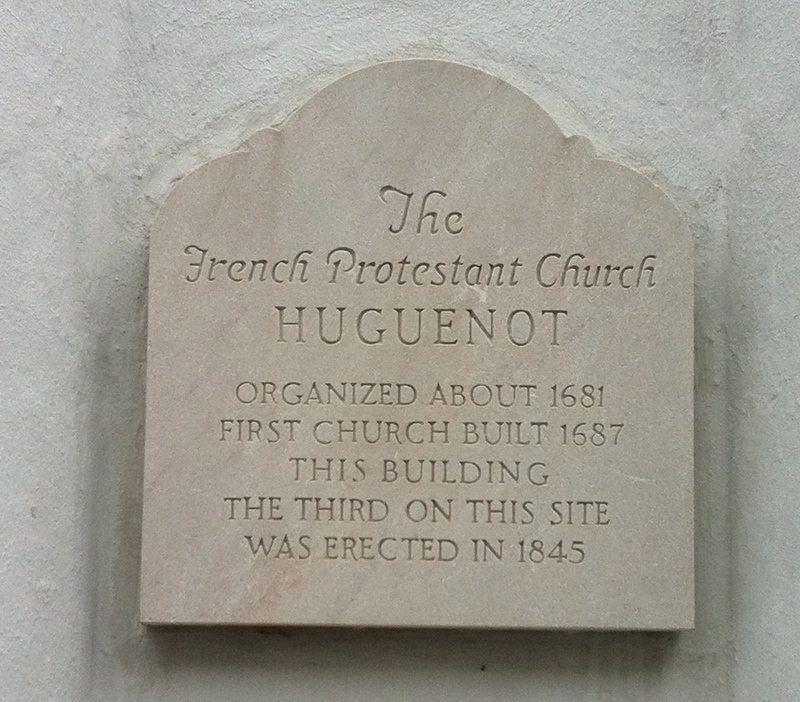 Charleston is still home to the oldest Huguenot Church in America, established in 1681—and by some accounts, the sole surviving French Calvinist congregation in the country. The congregation these days is anglophone, of course, but the church holds two French-language services each year. 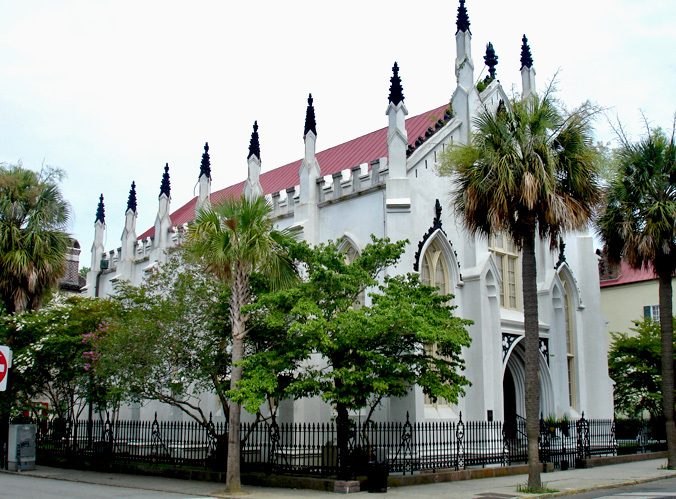 It is located in Charleston’s French Quarter—certainly not America’s most famous French Quarter, but an important one, nonetheless. Bounded by the Cooper River, Market Street, Meeting Street and Broad Street, it was named the “French Quarter” in homage to the many French merchants who settled there in the city’s early days. 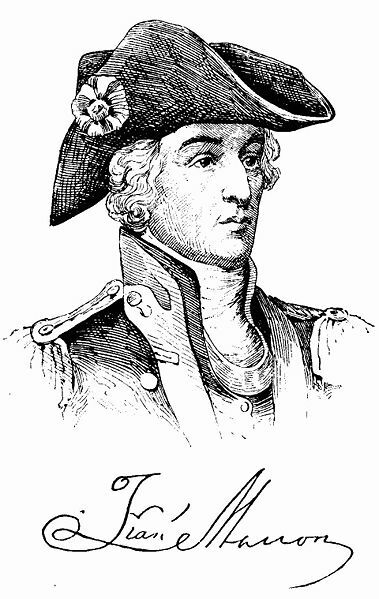 The city and county of Laurens are named for Henry Laurens. Laurens is a little-noted leader of the American Revolution, who served as President of the Continental Congress after John Hancock, was a South Carolina signatory to the Articles of Confederation in 1778, and was one of the United States’s peace commissioners during the negotiations leading to the Treaty of Paris of 1783, ending the American Revolutionary War. 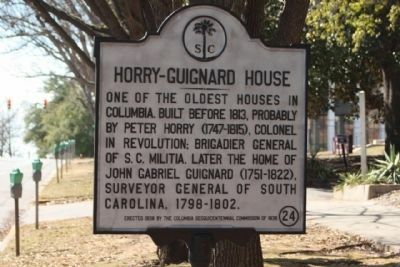 Horry County, the largest county in South Carolina and home to Myrtle Beach and the Grand Strand beaches, was named for Peter Horry, a brigadier general in the South Carolina Militia during the American Revolution, who later served under General Marion after the fall of Charleston in 1780. Because he happened later to move into the house that Peter Horry built in Columbia, that brings us to John Gabriel Guignard. Guignard served as the Surveyor General of South Carolina and is the namesake of Guignard Drive in Sumter and Guignard Park in Cayce. One of the more famous streets in Columbia, which borders the State House grounds to the north is Gervais Street, named for John Lewis Gervais. 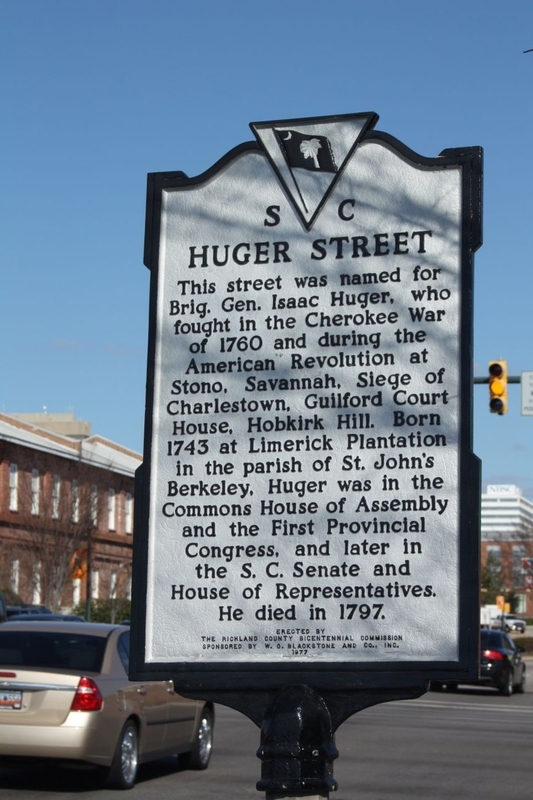 A Huguenot born in Germany after his parents immigrated there in 1741, Gervais subsequently immigrated to South Carolina in 1762. He served in the Continental Congress as well as in the state Senate of South Carolina, where he championed efforts to establish a new state capital at Columbia. So there you have it — a brief survey of South Carolina’s grand French heritage. Let’s be proud of it, fellow South Carolinians … even if we don’t always pronounce it correctly! May 14, 2012 P.S.—A May 13, 2012 article in Columbia, South Carolina’s The State newspaper provides a nice discussion of Ribault’s settlement at Charlesfort. You can access it here. My own account here on je parle américain can be accessed here. Extremely interesting history Michael!!! All my Carolina ancestors are presently rolling around in their graves clapping furiously and would give you a standing ovation – if they could – but standing is out of the question! Am forwarding this on to David’s daughter – surely they will find this most enlightening since they have been living and raising kids in and around Aiken SC. Impressive work! Thanks so much, Marti! I did particularly enjoy writing this one. Nothing would infuriate my mother more than when Joe Pinner would be on TV and have some reason to mention Huger St. because he would blatantly say “Hyoooo-gur” and she would fly off the handle. Next you should do a post on how SC people pronounce names, particularly French ones. In fact, I have a book by USC professors published many years ago on that very topic. First up: Legare. Second up: Lesesne. I guess you are also related to Capt. Peter DuBose? Bonne nuit. DUH, YOU FORGOT THE MOST IMPORTANT FRENCHMAN EVER: JACQUES BISHOP!